The GFCI receptacle is one of the best inventions that have been made when it comes to electrical devices. The GFCI receptacle has been designed for one purpose, and that is to protect you and your family from electrical shock. The GFCI can interrupt household circuits when there is a difference between the current in the hot and the neutral wires. When the GFCI detects the difference in current, the GFCI will automatically cut off. GFCI receptacles and GFCI breakers are very sensitive. A typical circuit breaker is designed to cut off at 15 or 20 amperes. However, someone can be electrocuted with 100 milliamps. 100 milliamps is a tiny number; it's a small fraction of 1. We have been asked many times, “can less than one amp hurt or kill me?” The answer is yes. That is why it’s so important to have GFCI installed. There are two types of GFCI protection. Both GFCI circuit breaker and GFCI receptacle will detect a few milliamps and trip the breaker to remove a potential shock hazard. Not only can the GFCI protect you from electrical shock it can save your life. It’s important to know where GFCI’s should be installed around your home and business. That is where John's Electric can help you today. GFCIs are required in your kitchen, bathrooms, garages and all outdoor outlets? There are certain rules that must be followed when it comes to GFCI breakers and outlets. When it comes to GFCI’s, here is what is important. GFCI’s should have been tested and certified by a UL certified company? Was the GFCI installed correctly? Has the GFCI been installed where it is required? Nothing is more important that the safety of you and your loved ones. 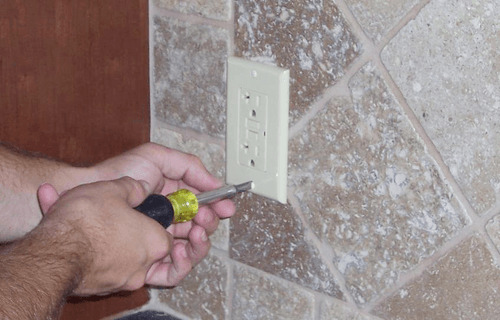 If you have any questions or concerns about the outlets and circuits that are in your home, then call John's Electric today. What an amazing electrician Aubrey is!!!! He is honest and he charges reasonable! Never tried to upsell me once and I never felt taken advantage by him! Was the only electrician that came as soon as I called and was always upfront about everything! All the reviews about him are true! That's how I found him and he's proven to be everything everyone has said! Call the best so you can get great service! John's electric is an extremely good company. I would this company to anyone I know. He is very professional and goes the extra mile for his customer. Five stars in my book. They were prompt, professional and honest in their work. First, they were there within the hour of calling them. Secondly, I thought I had 2 bad florescent lights, but it turned out to be tripped GFI outlets. Instead of just going ahead and replacing the lights, the electrician found the tripped outlets and let me know that was all the problem was. He showed me where they were so, if I had a problem in the future I could look there first. I appreciate his honesty. It saved me a lot of money. My Mother recently came to live with me, and I needed a fan installed in her west-facing room, to keep it cool in the guest room. I had to wait a little bit, but it was worth it. The price was reasonable, I could tell he was conscientious and he made an extra effort to do as much as he could while he was here - including going down through a difficult attic to install, so the wires would not show. Highly recommend. He came with his grandson and they worked a few hours. Hoping to get him back soon for some more work. Thank you, John!